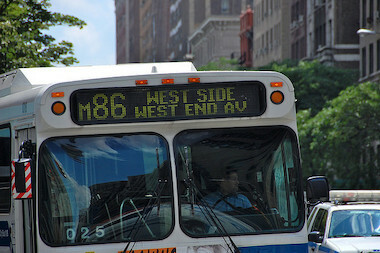 Select Bus Service will replace the M86 by spring 2015, according to the DOT. UPPER EAST SIDE — Select Bus Service is coming to East 86th Street, aiming to speed buses and improve pedestrian safety on the busy road. The Department of Transportation plans to replace the existing M86 buses with Select Bus Service by the spring, adding islands where pedestrians will buy their tickets before boarding the buses. The project will also include new seating and planters along East 86th Street, according to the DOT’s presentation to Community Board 8’s transportation committee on Wednesday night. While residents generally supported the Select Bus Service plan, many worried that the new bumped-out sidewalks for boarding the buses, called bus bulbs, would worsen traffic congestion on the street. DOT representatives assured residents that traffic and pedestrian studies have shown the Select Bus Service changes would not adversely affect traffic and would actually increase safety. SBS buses would make bus rides 15 to 20 percent faster than the M86, which serves 25,000 riders per day. The bus bulbs will provide space for fare machines and benches to sit and wait for the bus without interfering with the pedestrian flow on the existing sidewalk, according to Aaron Sugiura, a project manager at DOT. The Select Bus Service will run along the existing M86 route, but the DOT may remove the stop at Central Park and consolidate the stops on York Avenue at East 91st and 92nd streets. Some residents were glad to see more seating for pregnant, elderly and disabled people who are waiting for buses, but others wanted to see the plan rolled out more slowly to ensure it did not have an impact on traffic. Community Board 8's full board will vote on the plan on Feb. 18.